A little snow isn’t going to keep us in the house now, is it? Of course not. J’s schedule has been wacky this week and tonight was pretty much the last opportunity we would have to eat out until next week. I had already started prepping dinner when I got an e-mail from J asking about dinner. 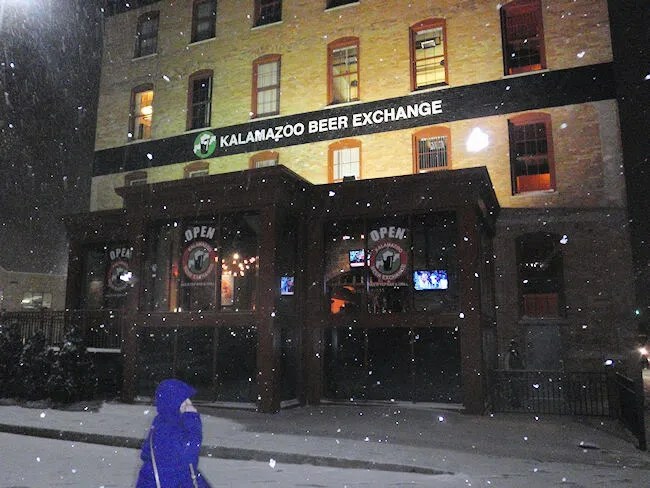 She said she’d rather go out and yesterday, I saw a tweet from Sarah Lee that the Kalamazoo Beer Exchange was open. I knew they had been open for lunch for a couple weeks, but the didn’t have their liquor license yet, so they were only doing lunch. I asked about beer and she said they were a go. I called before J got home just to double check they were open so we didn’t waste a trip through Death Storm 2010. 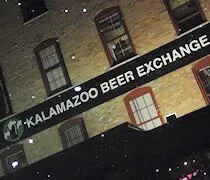 The Kalamazoo Beer Exchange is in the Globe Building in downtown Kalamazoo. It takes up the space that was formerly Charlie Foster’s which was closed before J and I even moved to Kalamazoo, so I have no idea how much work was done inside before the Beer Exchange opened. There is a parking lot at the corner of Water and Edwards, but the entrance to the restaurants is on Water Street in the middle of the building. I guess I always assumed the entrance was near the parking lot area which is lit up and where the majority of the signage is. The door from the outside opens up into a small hallway and the restaurant is immediately to your left. The Globe building houses a number of other businesses, but the Beer Exchange takes up a prominent position. The hostess station is right inside the door. Once you walk through the gate to get in space, you are immediately met with a choice. Up or down. Street level is sort of an in between floor. If you go down from the entrance, you find a space with pool tables and a bar. This area has more of a small pub feel to it. If you go up the stairs, you will find more of a traditional pub. There is another bar, but there are also a number of tables and booths as well as an open kitchen that lets you watch them make all their dishes from scratch. The Beer Exchange hasn’t really advertised the fact that they are open yet. In fact, according to an owner that stopped by our table, all they’ve pretty much done was turn on the “open” sign and let people notice it on their own. With that said, it was kind of surprising to see most of the tables being used. The clientle ranged from young couples to college aged beer drinkers to families with young children. The place has a really comfortable, loft atmosphere where most people would feel comfortable. The hostess took J and I to a booth near the kitchen which was very cool because we got a good look at all the dishes going out. That made our decisions a little bit harder. First decision we had to make was beer. There was a bottle menu on the table that we had started looking at, but the server said not all of those were in yet and he pulled a draft menu out for us to look at. The cool thing about the Beer Exchange is how they price the beer. It works a lot like the stock market where a higher demand that day means a higher price. There is a set minimum and maximum for the beers, but the price can be anywhere in between depending on how much they are selling that day. I, not being a beer connoisseur, stuck with what I knew and ordered a Bell’s Two-Hearted Ale. J ordered a Dark Horse Brewery Raspberry Ale which she really liked. It went down real smooth and she was even thinking about ordering second. A rarity for us when we just drink during dinner. Neither one of us had really eaten lunch and J was starving, so we actually ordered a side. Another rarity for us. The one that really jumped out to me was the Chili Cheese Fries. 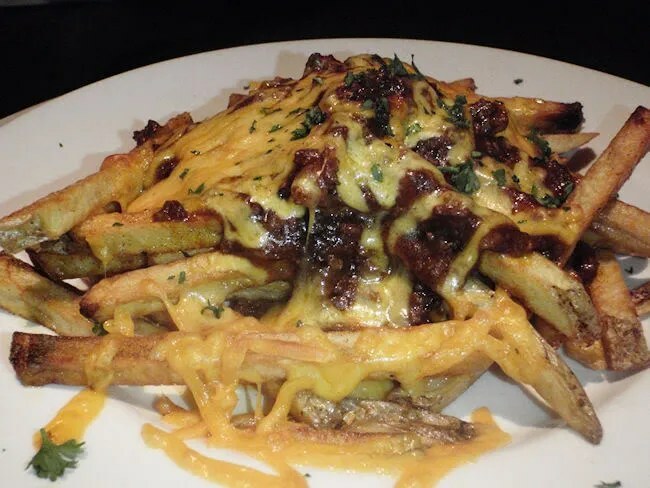 They were hand cut fries topped with Detroit Coney Sauce, and cheddar cheese. These fries were out of this world. The fries alone were perfect hand cut fries that soaked up the coney sauce. That sauce was good enough to eat on it’s own. Not being a native Michigander, I’m not an expert on the different styles of coney, but we were told it was an authentic Detroit recipe. I’m not a hot dog eater either, but I love eating the Coney Sauce like chili. The sauce on these fries was good enough to a whole big pot of without a hot dog or the fries. There are two burgers on the menu and, for once, I went with the more expensive one. I chose the Piedmontese Beef Burger. 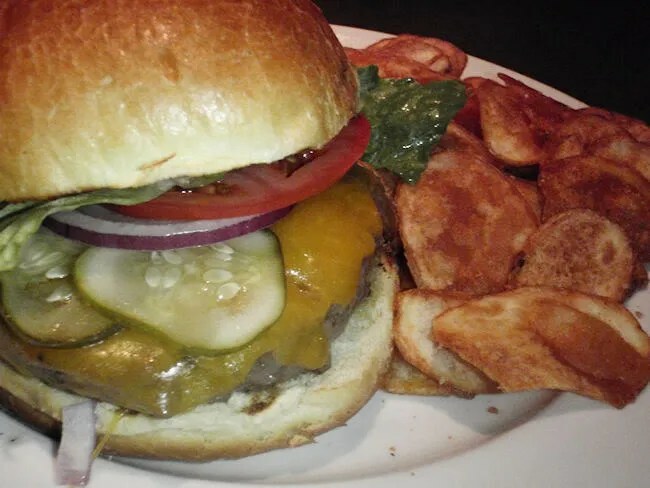 The sandwich is a 1/2 lb Piedmont Beef served on a toasted Brioche roll with pickles, lettuce, and onion. Bacon and cheese are a buck extra each. I went just with the cheese. The burger was delicious. It had a little line of pink running through the middle and even for a beef with a little less fat, it was still very juicy. The sandwich is served with chips with the option of upgrading to fries for a buck. Since we go the appetizer, I stuck with the chips which was a really good choice. The chips are home made. Cooked perfectly to a crispy golden brown and lightly salted. For once, the option of chips instead of fries is not a bad thing. They were fantastic. J ordered the Pesto Chicken sandwich. 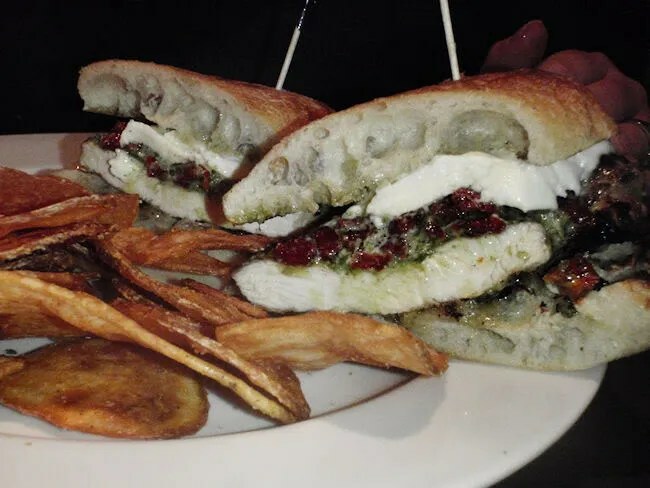 That sandwich is constructed with a grilled, smokey chicken breast topped with a sun-dried tomato pesto, and mozzarella cheese on a ciabatta bun. I’m not normally a huge fan of pesto, but the little bit I had of her sandwich was amazing. The chicken had a great grilled flavor. She loved the sandwich so much she wanted to enjoy it tomorrow too, so she only ate half so there would be leftovers for lunch. She also got chips which she also loved. It’s so hard to cook potato chips right, but they have perfected it. Our bill was around $38. If you follow this blog, you know that’s a lot more than I like to spend on dinner, but we did go a little all out tonight. We both had drinks and I went for a $12 sandwich instead of the cheaper burger. We also got an appetizer which isn’t normal, so the $38 isn’t really that bad. The food is fantastic and the atmosphere is one of the best in Kalamazoo. We both left raving about our meals and already planning a return trip. When it gets out that this place is open, getting a table may be hard during peak hours. I really like the concept and I think Kalamazoo is going to as well. Good call on the pub chips. The appetizer comes with a french onion dip, and they’re now my favorite chips in Kalamazoo.